Are you trying to track your steps, but weary of inaccurate, bulky, inconvenient pedometers? The Omron pedometer HJ 325 provides an effortless way to track the fitness measurements you care about. You can automatically and easily track your steps, distance covered, aerobic activity, and calories burned with Omron HJ 325. The HJ-325 is ultra-lightweight at only 4/5 of an ounce, also comes with clips, straps, and a holder. Hence you can place it almost anywhere. Clip it to your clothing or undergarments, or your belt, put it in your purse or backpack, put it in your pocket. It will stay put, and will unobtrusively and automatically track every step you take. If it detects 10 minutes of activity over 60 steps per minute, it will start measuring (and storing) aerobic activity as well. Your walking/running distance for the day is measured in your choice of miles or kilometers, as well as daily caloric output. Even better, your measurements are stored for 7 days. 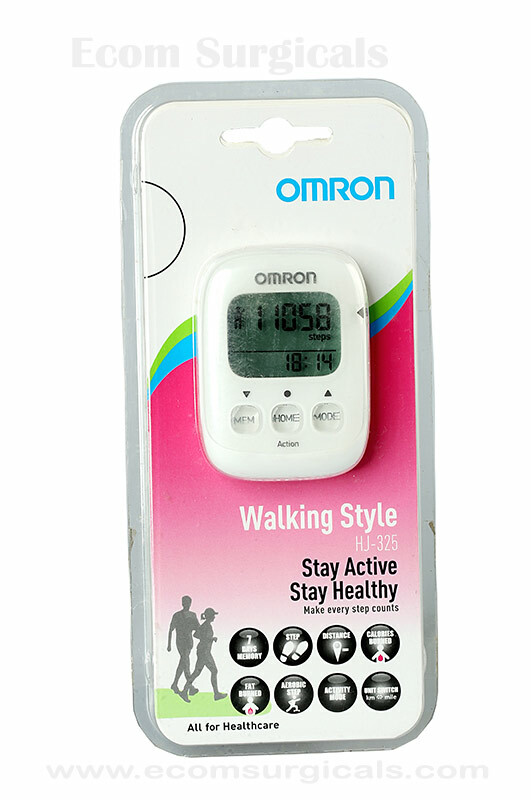 The technology behind the Omron makes it one accurate pedometer. You won’t miss steps because it is flat, horizontal, or vertical. Its 3-D sensors make it accurate in any position. 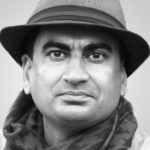 Have your past pedometers been inaccurate in calculating your stride? This Omron pedometer is extremely accurate in automatic stride calculation, but also gives you the ability to adjust your stride if you desire. When it comes to changing your battery, nothing could be simpler. 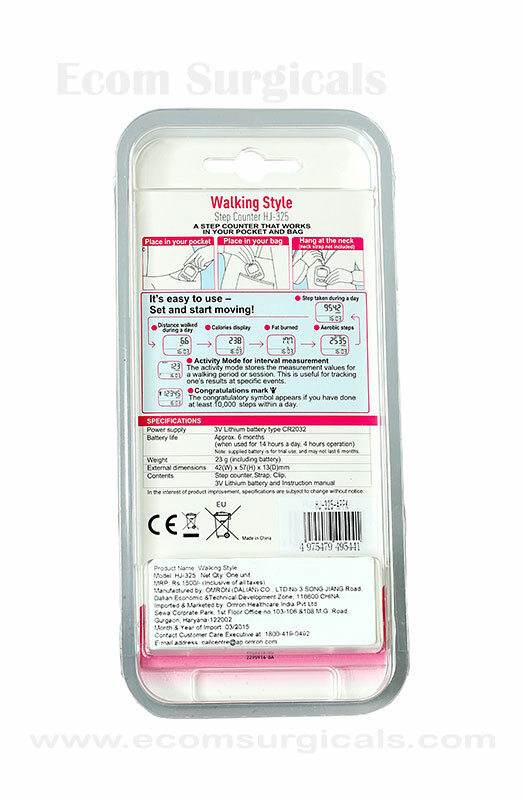 The Omron Step Counter HJ-325 uses the easy-to-find CR2032 lithium battery, which installs without tools. Plus, it lasts for six months at a time so you will never have to worry about charging your pedometer overnight. Although it automatically tracks your daily measurements, tracking measurements for a specific workout is a piece of cake with the large, easy-to-use function buttons to set the start and stop times. Are you tired of trying to actually see the numbers on your pedometer? The Omron Pedometer HJ-325 has large, easy-top-ready numbers, so this won’t be a problem. 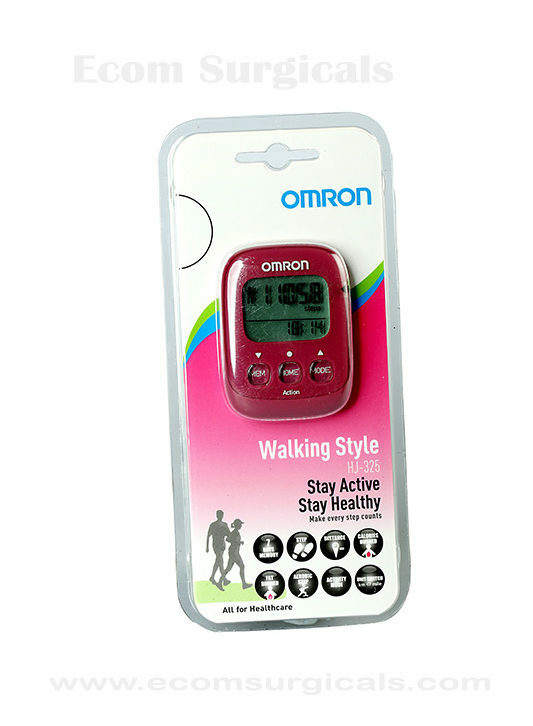 Hence Omron Step Counter/Pedometer HJ-325 is the perfect pedometer for someone looking for a way to effortlessly and accurately count their steps and more. Includes clips, straps and holder to carry it almost anywhere. Automatically calculates calorie expenditure and also starts counting aerobic steps automatically. Automatically calculates length of stride, with ability to make manual adjustments if desired. Uses common CR2032 lithium battery. Also six-month battery life with easy-change battery. Dimensions are 1.65″(w) × 2.24″(h) × 0.51″(d) / (42.0(W) × 57.0(H) × 13.0(D) mm). You know the health benefits of tracking your steps. But you don’t want the hassle that comes with most pedometers. 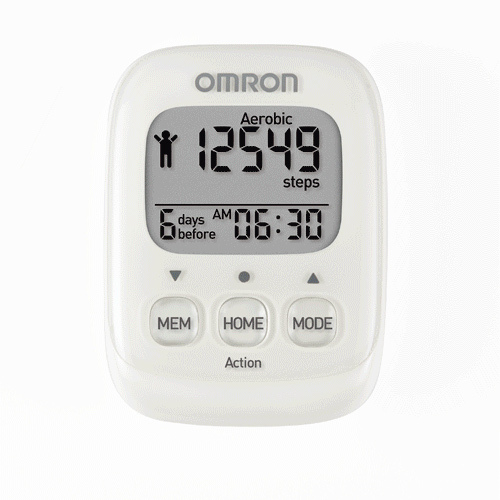 Try the Omron pedometer HJ 325 for an almost effortless way to accurately count your steps.